It is rare to lose the turnover battle 4-1 (really 4-0) and win against an average team. Yet Ohio State lost the turnover margin by that margin – and beat No. 2 Oregon by 22 points in the national championship game. The Buckeyes did so by controlling every aspect of the game. Ohio State dominated third downs, field position, the red zone, and explosive plays. The Buckeyes leveraged their opportunities by making critical strategic adjustments to respond to Oregon's offensive and defensive schemes. The Ohio State defense completed a meteoric rise with its best performance in years: holding Oregon's prolific offense to 20 points. Defensive coordinators Chris Ash and Luke Fickell unveiled several subtle adjustments to their base defense to bridle Oregon. Ohio State studied past Stanford teams for ways to successfully defend the Ducks. For starters, the Buckeyes frequently utilized an odd three-man defensive front in addition to its standard 4-3 over. In a three-man front, the nose guard aligns head up over the center, while two defensive ends align over the tackles. The Buckeye defense first used an odd front on Oregon's opening drive. From this formation, the Buckeye defensive line could slant or squeeze down against inside zone. Next, Ash and Fickell matched Oregon's numbers on each side of the center. 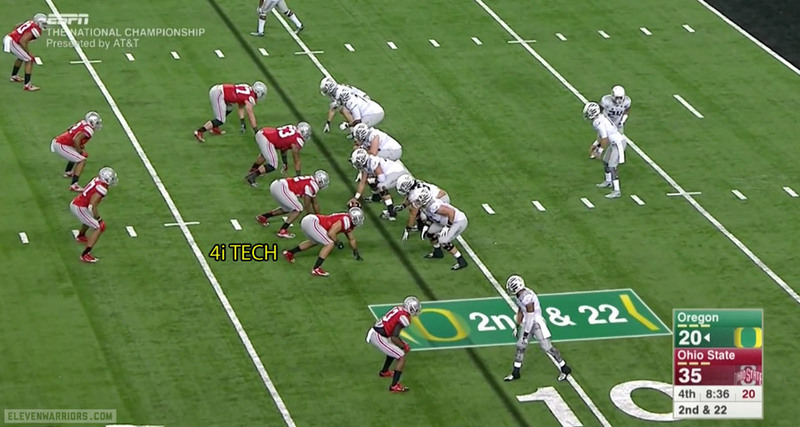 Specifically, the Buckeye linebackers would significantly shift based upon the Ducks' alignment. By matching numbers on each side of the field, Ohio State ensured it could defend the entire field against Oregon's read scheme. Although Oregon is not a true triple option team, the Buckeyes had a defender account for each aspect of Oregon's packaged zone read screen. Ash and Fickell wanted to ensure that Marcus Mariota was accounted for at all times, determining that their defensive line could control the Oregon run game. Ohio State had one linebacker defend the backside edge for the quarterback run and either a linebacker or safety account for the wide receiver screen. The defensive line and remaining inside linebacker defended the inside zone. For instance, when Oregon went wide trips to the field, walkout linebacker Darron Lee played over the trips to account for the screen. The Mike shifted to the wide edge for the quarterback run. The Will played over the center to defend the inside zone. 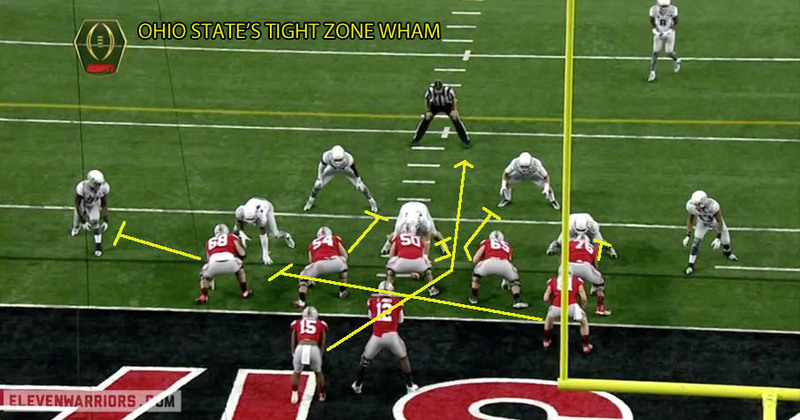 When Oregon used 11 personnel with their tight end attached to the line in a 2 x 2 deuce formation (a slot and split end to one side and tight end and flanker to the other), Ohio State aligned with Lee over the slot and the Mike and Will in the box. To the running back side the Buckeyes would execute a scrape exchange. And when Oregon used deuce formations with a detached tight end, two of the linebackers often played in the overhang area. In each situation Ohio State sought to ensure a linebacker matched the Ducks' formation and accounted for Mariota, allowing the defensive line to focus upon the inside run game. 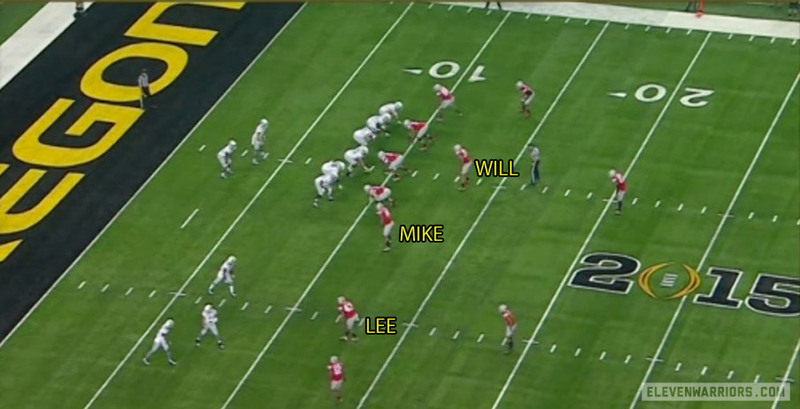 Ohio State frequently brought the Mike on an edge blitz to keep Lee free and allow him to defend the edge. Alternatively, the Buckeyes would bring a boundary corner blitz. The goal was the same – have a defender account for the quarterback so that the defensive line could squeeze down to defend the inside run game. For instance, one technique Ohio State used with their defensive line to limit the run was to bring the boundary end inside to a 4i technique. 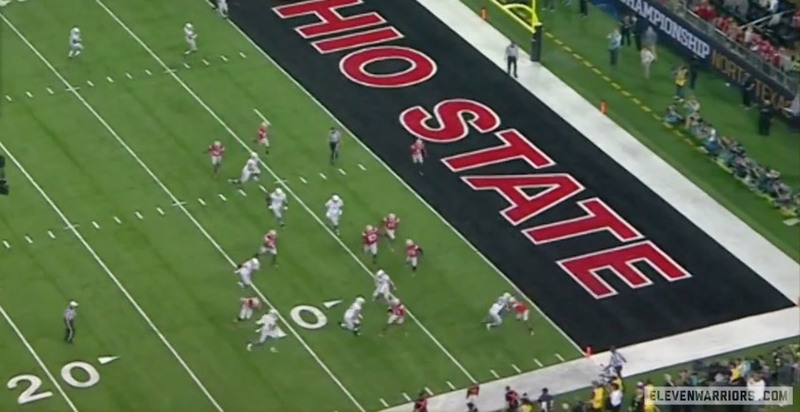 In the secondary, Ohio State mixed its base cover 4 with a heavy mix of single high cover 3. This reflected the Buckeyes' heavy use of early down zone blitz. The Buckeyes would bring an edge rusher – be it an overhang linebacker or boundary corner – and play 3 deep, 3 under behind. But Ohio State also used single high safety coverage with a four man rush, bringing a safety down to play the edge. Ash and Fickell's basic goal was clear: limit Oregon's zone read and screen package and force the Ducks to throw the football downfield. Oregon scored a touchdown on its first possession, but two drops on ensuing possessions allowed the Buckeye defense to settle in. Oregon's longest run on the day was 11 yards (with only six successful rushing attempts) and the Ducks were only 2 for 12 on third downs. The Buckeye defense played well at all three levels. The defensive line was excellent at closing down inside gaps. The linebackers – perhaps the most improved position group – pursued the football well and closed inside out. As anticipated, Lee was critical to defending the Ducks' horizontally. Oregon's wide receivers could not consistently block Lee to enable their perimeter plays. Yet Lee was able to also apply himself as an edge rusher and against the run. Except for a few miscues, the secondary played with discipline. The Buckeye back end did not jump underneath routes, preventing Oregon from getting the easy play action explosive plays that make the Ducks offense so successful. A short-handed Oregon receiving corps had difficulty getting open against the Buckeye secondary. Most importantly, at all levels Ohio State tackled, preventing yards after contact. By forcing Oregon into third and six or more, the Buckeye defense eliminated the Ducks' tempo and put Ohio State in an advantageous position: its pass rush versus an Oregon offense forced to pass, which left the Ducks below average on passing downs. The Buckeyes' red zone defense was critical to the win. After struggling all season in the red zone, Ohio State held Oregon to 6 points on three drives inside the ten, 15 points below the expected value. The Buckeyes maneuvered Oregon into third and mediums, forcing the Ducks to throw to the back of the end zone. Perhaps no goal line stop was more important than holding Oregon to a field goal off a short field after Ohio State's fourth turnover, allowing the Buckeyes to maintain a 21-20 lead and momentum. Between limiting red zone opportunities and winning the special teams battle by garnering eight more yards per punt attempt and creating better field position, Ohio State was able to overcome their miscues. Other than the aforementioned turnovers, the Ohio State offense was rarely stopped. As noted, Oregon's bear 3-4 front is designed to take away the Buckeyes' base inside zone play. 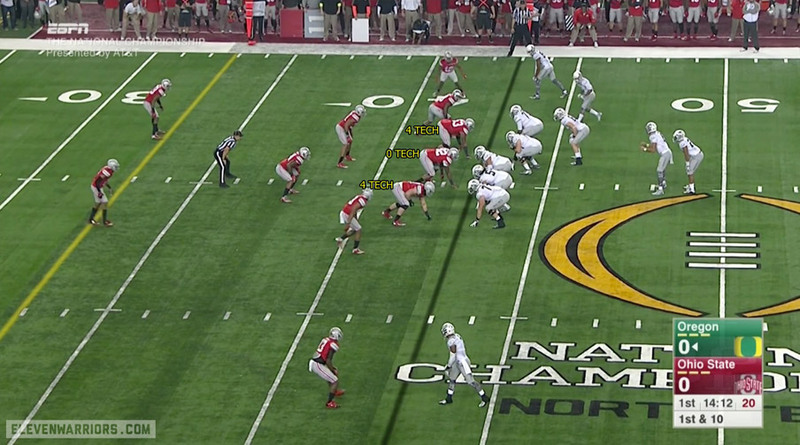 So Ohio State's task was finding ways to run the football that took advantage of the Ducks' alignment. Once the Buckeyes found those weaknesses, they were able to run the football with impunity, leaving Ezekiel Elliott with a 67% success rate. In the first half that came from combining sweep read with a wrinkle to the Buckeyes' base inside zone play, a wham block from the tight end. Wham is an inside trap. The tight end blocked back on the first down linemen past the center. The remainder of the line executed inside zone, akin to split zone. Oregon's inside linebackers overplayed the backside A gap cutback, allowing the wham block to open the run to the front side. In the second half, Urban Meyer and Tom Herman heavily relied upon counter trey. 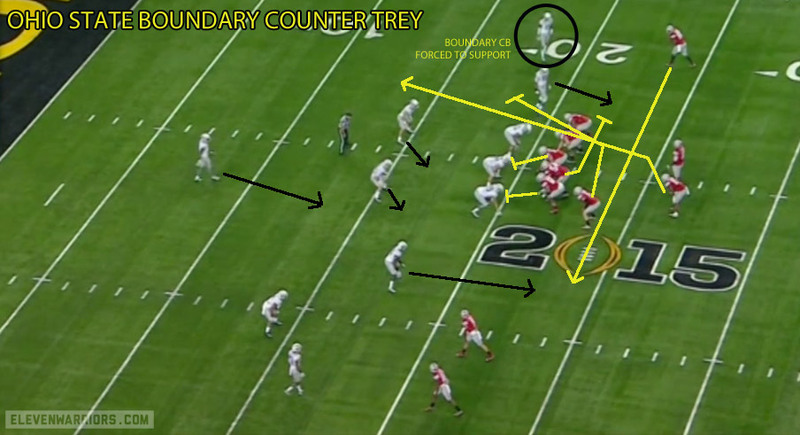 Counter trey is a gap blocking scheme, featuring down blocks on the front side of the offensive line and a pulling backside guard and tight end to kick out the outside linebacker and lead on inside linebacker. As Jim Light describes, Meyer and Herman used formations and motion to maximize the play's effectiveness. Herman repeatedly dialed up counter trey to the boundary off a jet sweep fake. The jet sweep fake forced the Ducks to use a single high safety and rotate their secondary to the field, leaving a backside secondary player as the only remaining force support. To run the play to the boundary, Ohio State put its formation strength to the field, forcing the Ducks to rotate their secondary towards the field away from the run. The jet sweep fake increased this rotation, forcing the Ducks to use a single high safety and rotate their secondary to the field, leaving a backside secondary player as the only remaining force support. Particularly effective was an unbalanced trips look, meaning that one of the trips receivers were ineligible. This allowed the Buckeyes to use a backside flanker for the jet sweep motion. Even though one of the receivers was ineligible, the Ducks still had to cover up both receivers to defend the jet sweep and not create an easy two versus one wide receiver screen. Oregon's 3-4 alignment created easy down blocks for the off-tackle run. The Ducks outside linebackers exacerbated this hole by coming hard up field, making for an easy kick out block. So rather than spilling the play, the Ducks allowed Elliott to consistently hit the C gap, where he was left one on one in the secondary. After running the multiple times from unbalanced, Ohio State reverted to a 2 x 2 deuce formation. The jet motion still pulled the backside safety towards the field, providing Elliott the corner to the end zone. Before the game I discussed the increasing similarities between the Oregon and Ohio State spread attacks. One significant difference is that Meyer trades tempo for run game versatility, permitting the Buckeyes to use a variety of zone and gap schemes. This provides Ohio State a variety of responses to different fronts. And once Meyer finds such an advantage, he uses it until the opponent adjusts. To utilize the passing game, Herman and Meyer utilized vertical stretches to work between the underneath and deep coverage. A vertical stretch means that the offense is trying to use two receivers to put one defender in a situation where he must defend a route both in front and behind him. The Ducks primarily utilized quarter-quarter-half and cover 3 zones. 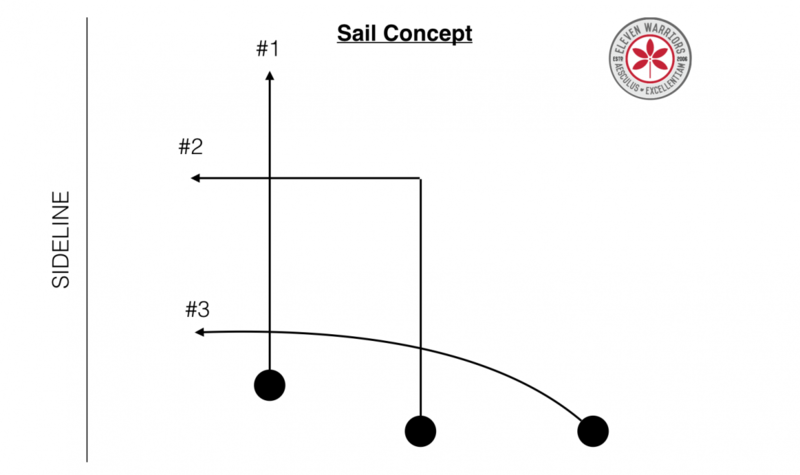 One critical vertical stretch play in response was vertical flood routes to the sideline such as the sail concept. The outside fly route cleared Oregon's deep quarter corner, allowing the deep out to come open underneath. The Buckeyes also ran wheel routes off a similar flood action. Vertical stretches such as sail and drive crossing routes were critical versus the Ducks' soft secondary coverages. Meyer and Herman likewise opened up a deep post to Smith off a similar vertical flood combination by manipulating the Oregon deep safeties. Ohio State sent a receiver in motion to the sideline. This pulled the safety wider, allowing the post to come open behind. The offensive line – including the blocking of the tight ends and receivers – and Elliott again deserve credit for controlling the football game. The Buckeye offensive line wore down the Ducks defensive line and did an excellent job coming off combo blocks to the second level. Elliott was again the best player on the field. His vision and feet have markedly improved this season. He is patient waiting for the hole to develop before making one cut and go. And while he was using too much forward lean early this season, he is now combining his forward lean with balance. He has the speed to reach the edge. But he runs with power in the secondary, and is always falling forward. But although he was just making his third start, Cardale Jones' role was as critical to the Buckeyes' recent offensive success. It is no coincidence that Elliott has rushed for 200 yards in each of Jones's starts. Jones's arm strength forces defenses to play with deeper safeties. For instance, in one-high looks Oregon regularly kept their safety 20 yards deep. This reduces force support and creates worse angles when Elliott breaks free. Here's an obvious running situation for Ohio State – 1st and 10 with "11" personnel, yet Oregon's safety is deep and the corners are already starting to bail to deep thirds. And Jones has been critical to the Buckeyes' third down conversion rate, particularly in third and long where the offense is in a must-pass situation. Jones' arm strength lets him push the football down the field before secondary defenders can break. Jones is willing to stand in pocket in the face of an oncoming rush and deliver an accurate football. Jones's legs were again critical. This came both in the form of him picking up several first downs scrambling. The upshot was that Ohio State had a 42.9% success rate on passing downs – far better than the national average – much better than Oregon. And Jones' running was as critical in picking third and fourth down short yardage conversions on called runs, enabling Ohio State to go 11-18 on third and forth down. Jones has room to improve. He needs to work on his reads in the zone run game, and at times he is unwilling to put the football in tight windows. But Jones demonstrated an ability to remain calm in pressure situations. There was no better example then him going 6 for 6 on consecutive Ohio State scoring drives after the his second fumble allowed Oregon to cut the score to 21-20. Over the Buckeyes' three game championship run it was the ease with which Jones assisted Ohio State in creating explosive plays in the passing game that allowed the Buckeyes to stretch the defense vertically, making the Buckeyes more difficult to defend inside and horizontally. It was this formula – creating explosive plays in the run and pass game and dominating third down – that Ohio State utilized in its three game championship stretch. In so doing, the Buckeyes demonstrated that they were one of the most improved teams in recent memory. And Meyer and his staff deserve the credit for one of the most impressive coaching jobs in college football history.